The Sèvres porcelain factory started out cutting-edge and has stayed that way ever since, creating pieces that turn fantasy into gorgeous reality. Times were grim for the Sèvres porcelain factory in the 1790s. It was almost offered for sale in 1790, but King Louis XVI opened his own purse to keep its kilns lit. Three years later, the king’s angry subjects sent him to the chopping block, and the Sèvres factory nearly followed. But remarkably, the National Congress voted to spare it. 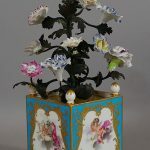 While its legislators were deeply irked by the antics of Sèvres’ high-born patrons, they deemed Sèvres itself “one of the glories of France” and permitted it to carry on making its exquisite luxury goods. The revolutionaries “always understood it was wonderful stuff,” says Leon Dalva of Dalva Brothers, a Manhattan gallery that specializes in Sèvres. We continue to talk about Sèvres porcelain today, centuries after it first appeared, because it’s still wonderful stuff—gorgeous colors, delightful shapes, expertly made. Pieces that thrilled the crowned heads of Europe in the 18th century turned the heads of Henry Clay Frick and Marjorie Merriweather Post in the 20th. The endurance of Sèvres porcelain may be linked to the reason its founders moved the factory in 1756 from its original location in Vincennes to Sèvres. The new town wasn’t near a deposit of clay or a forest of wood that could fuel the kilns, but it was convenient to Versailles and its deep-pocketed nobles. Placing its headquarters close to its customers rather than sources of raw materials was an inspired choice that planted the seeds that would sprout and grow into the modern French luxury goods market. 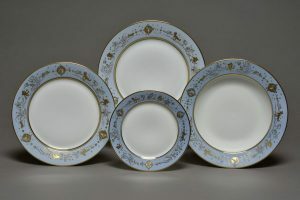 Periodic exhibition sales of Sèvres’ latest, held within Versailles, became such a tradition that even when the revolutionaries forced the royal family back to Paris, the king was permitted to conduct Sèvres sales at the Tuileries Palace. 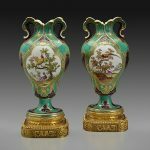 “Everyone who wanted to be in good favor at court would buy a piece,” says Liana Paredes, director of collections and chief curator of the Hillwood Museum and Gardens in Washington, D.C.
That bright team did something very, very French—they figured out how to transform their shortcomings into high style. 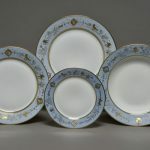 During the factory’s early decades, the clay available to Sèvres was only fit for making soft paste porcelain; it lacked the kaolin that was in the clays used at Meissen and in China to create the more desirable hard paste porcelain. Hellot transformed soft paste’s challenges into virtues by concocting formulas for seductively candy-like hues. “It [the color] really sank into the body of the porcelain and acquired a depth and a brightness of color that was unattainable in hard paste,” says Paredes. Duplessis matched Hellot’s eye-popping colors with magnificent and daring shapes to decorate. “I think he was a genius in a way,” says Paredes, commenting on how Duplessis managed a more restrained take on the rococo style that prevailed in the 18th century. “The way he designed was about volume and plasticity and great shapes.” Sèvres’ expert marriage of color and form comes through clearly in a soup tureen and matching platter made at Vincennes in 1754 and now in Hillwood’s collection. “Duplessis was clearly looking at silver tureens,” Paredes says, pointing out the gilt-edged leaves that grace the legs of the Sèvres tureen. Its ground, or main background color, represents one of Sèvres’ inaugural achievements—a lush shade of blue that didn’t emerge from the kiln looking patchy, cloudy, or uneven. Hillwood has another early Sèvres piece that glories in a technical achievement and shows how adept the factory was at exploiting the zeitgeist for marketing purposes. In 1757, Sèvres sold a cuvette “Mahon,” a type of flower vase that features a previously hard-to-master color: pink. Before Hellot nailed down the formula, the pink tended to drip and run and blend with the gilding on a piece, causing discoloration. To celebrate the triumph of chemistry, the powers at Sèvres named the new shade of pink after one of the factory’s best patrons, Madame du Pompadour. As it happens, she wasn’t a fan of that particular pink, but the name stuck, and she became the first person Sèvres honored by naming a color for them. 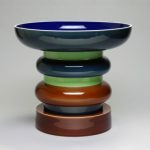 (A notable exception was the bleu céleste that graces the soup tureen and tray. The moniker given to this debut color achievement of Sèvres translates to “heavenly blue.”) The name “Mahon” alludes to a 1757 French victory over the English for control of the Mediterranean island of Minorca; Mahon was and is its capital city. The new color, the color’s name, and the nod to the island triumph unite in a trifecta of cheerleading for France and the glories of its empire. The Frick Collection includes many Sèvres pieces that Frick purchased from J. P. Morgan, among them a trio of pots-pourri with a purple ground, created in 1762. 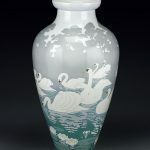 They have returned to their normal space in the Frick mansion after a year on display alongside other choice Frick Sèvres pieces in the museum’s Portico Gallery in an exhibition that ended in April. Vignon deems them among the “extraordinary, extremely rare” examples of 18th-century Sèvres that “every collector would die to have.” Frick wouldn’t have filled the pots with fragrant dried plant material, but even as far back as the time of Versailles, Sèvres customers accepted the idea that (tableware excepted) its punishingly expensive porcelain fancies were not to be used, even though they could be. “It served a different function. It served the function of decorating a home, and making a home fashionable,” says Vignon, adding, “It had a huge social function. In the close circle around the king, it [possessing choice Sèvres] showed if you were in or out.” Sèvres performed much the same role in 20th-century America, too; it was the sort of thing that Frick, as a Gilded Age titan, was expected to own, so he acquired it, paying as much or more than a French courtier would have when they were new. In 1916, he spent $100,000 on an exceptional ship-shaped pot pourri and a set of green-ground vases, all made in 1759.